In the wake of the Philadelphia Eagles winning the Super Bowl, I am reminded of the platform that many athletes and movie stars have to glorify God. The Eagles players and coach have been vocal about giving glory to God for the blessings in their lives. 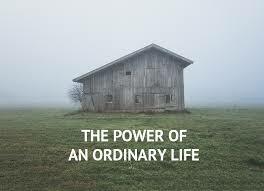 It is easy to use that platform to share your testimony when you have millions of people hanging on your every word, but what if you live an ordinary life? How do you look past the mundane to glorify God in your life? I have asked myself that question many times. I have lived my life wishing that I was a famous Christian women’s speaker like Lisa Whelchel or Candace Cameron Bure. I have dreamed of becoming a famous Christian author like Joyce Meyer or Beth Moore. I have written this blog with love and I have patiently waited for it to take off. 5 years later and that has not happened. I have not become the blogger with thousands of followers or the social media success story. I am still the ordinary single mom of 5, working in the food service department of a local convent and living paycheck to paycheck. I live in a lower income neighborhood in a city that Steve Martin once dubbed as, “Nowhere, USA” and a county that not to long ago had the highest poverty rate in Indiana. I live an ordinary life. So, how do you live to glorify God when you are living an ordinary life? Pray: You pray for every aspect of your community, from your family to your co-workers, neighbors, strangers who cross your path, and Government/Spiritual leaders. You pray for issues that effect your community from poverty to crime, employment opportunities, homelessness etc. If you pray over every every aspect of your community you will be glorifying God in your every day life. We are not only to love our family and friends, we are to love strangers, the homeless, and those who appear unlovable. There are many ways to show love: a smile of encouragement, a kind gesture, an act of compassion, standing for justice where injustice reigns, being a voice for the voiceless, etc. There are many ways to show our love, I challenge you to take a look around and see how you can love someone to Jesus. Serve: Matthew 20:28 tells us that Jesus did not come to be served, but to serve. He gives us an example of serving as He washes the disciples feet at the last supper. Everything Jesus did was about serving others: healing the sick, teaching the multitudes, bringing the dead back to life, and casting out demons. We can’t forget the greatest act of service that He performed, giving His life, that we may live. Look around you. How can you step out as an example of Jesus to serve those around you? Living an ordinary life may not give us the platform for sharing the Gospel that the rich and famous have, but that does not excuse us from doing what we are able to live out the example of Jesus in our own lives. I encourage you to look around and see what ways you can glorify God as you live out your ordinary life.